Do you like sunrises, or sunsets? As a West Australian, it’s hard not to love sunsets. We get incredible sunsets here in Perth, which I think is in part caused by living on the west coast of a country, with no land between us and the horizon. In summer it is brilliant, because the sun goes down so late, that you can get home from work, drive out to the beach and have a walk along as the sun goes down. It’s incredibly humbling, to stand there in front of something so massive, so beautiful. It’s a brilliant reminder of God’s handiwork, his creativity, his brilliance. 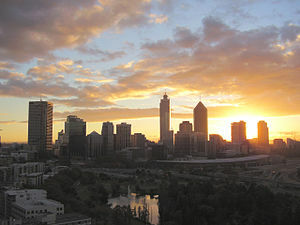 But, as the Perth sunrise is often no-where near as spectacular as the Perth sunset, I kind of regard sunrises as very special moments. I remember one from when I was a teenager. My family was on holidays in Albany, and as I was up early – and it was still dark – I thought I’d walk out to a special lookout, where I could see the sun rise over water. I have no recollection of it being incredibly beautiful, or stunning, but that moment, that space, has stuck in my memory, and most likely will for some time to come. I have often heard people describe sunsets and sunrises as “thin places” – where the gap between heaven and earth becomes very thin, and we can see some of the glory of God’s kingdom. I would not doubt this for a second.